I have finally found a foundation that I love! Now, that's a big thing for me to say, I've been through many foundations and have found few that have worked for me! This one seems to just work for me, so I am super happy about that! 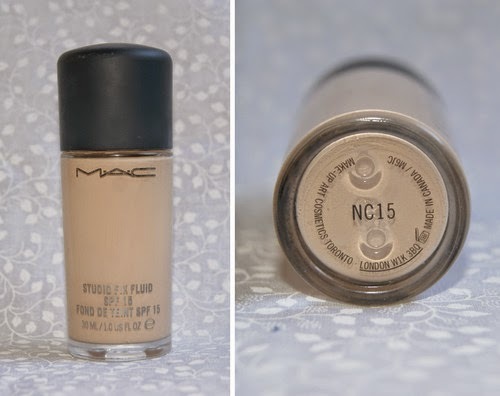 I went to MAC the other day and decided to get matched and get some help picking out a foundation since I was new to MAC and had never tried it before! They asked me what kind of foundation I liked and what coverage I liked the most! I told them I liked liquid foundation and that I wanted something full coverage since I enjoy looking flawless all the time. I was matched with the beautiful Studio Fix foundation in the shade NC15! This foundation has build-able coverage and a matte finish which I love! You can also make it look dewy of course if you prefer that too. It also has SPF 15 which I appreciate because you always want to protect your skin! If you're looking for a decently priced foundation ($32 CAD), amazing coverage which needs little to no help hiding blemishes, and a flawless finish this is definitely the foundation for you! Over all I give this foundation a 9/10!